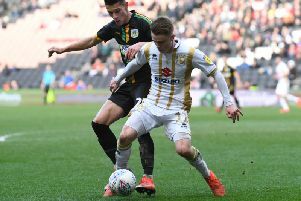 MK Dons' defensive injury crisis has helped Paul Tisdale develop a new style of play - but it is more through needs must. Arriving in the summer with cries for a new front line, Tisdale concentrated on shoring up the back line which conceded 69 goals in 46 games last season. He signed Jordan Moore-Taylor, Baily Cargill, Mitch Hancox and Mathieu Baudry before the campaign, while adding Russell Martin in January. Despite having an abundance of more-than capable defenders though, he is currently plugging round holes with square pegs as injury continues to ravage his back-line. His preferred formation - a back three - has not been able to flourish as expected since November and injury to Moore-Taylor. Having made just four appearances since the end of November, his was the first tower to fall. Since then, every recognised centre back has spent time on the injured list, with Hancox too ruled out. With personnel an ever-changing puzzle, Tisdale has had to be more creative at times, including playing midfielder Jordan Houghton at centre back to plug the gaps, while changing to a more conventional flat back four. "We get through a few formations in a game!" said captain Dean Lewington - one of the few defenders with a clean bill of health this season. "I have become fond of three at the back, it's a system that suits us. With injuries and the way the squad it, it isn't always like that. Three at the back suits seems to produce our best football. But we train for all of them and we're adaptable. "When we're fit, I think we've got seven centre halves but now we're playing Jordan Houghton in there. It has been a bad period, but it shows our adaptability. It has been unlucky, it doesn't help, but it is football and it happens." While far from ideal though, Tisdale says the injury crisis has helped his side become more used to playing in a second system, giving them a new range of options to call upon. "We've been able to develop another angle to our play," said the manager. "That is a positive – we can adapt and change during a game. But if we've got injuries and problems, other teams will have too. "It's not an excuse, we can't use it, but there's a correlation between continuity, developing partnerships, understanding and building units on the pitch over a period of time tends to deliver results. "We had a long period of two or three months when we had very few injuries in that position and you could see what happened to our results. It was the starting point and the bedrock of our performances. We've not knows since what defenders will be available. It is now affecting whether we can play three at the back or not. "It has been a shame not to be able to play in the way we had been in the build up to Christmas time and build on it. We've had to go backwards, but put a team on the pitch that is competitive. We've had strength in depth though, only just mind you, but it has been something we've wanted to develop. We've been a little bit held back since Christmas."